During the 1850's, steamboats plied at least three Kansas rivers. Can you name two? John Brown was hanged in Virginia in 1859. Where was he buried? Kansas briefly had a navy. On what body of water did the Kansas fleet sail? If the Kansas boundary were the same today as it was from 1854 to 1861, which would be the largest city in the state? Between 1859 and 1863, Kansas had both a large and a small gold rush. Name the large one. 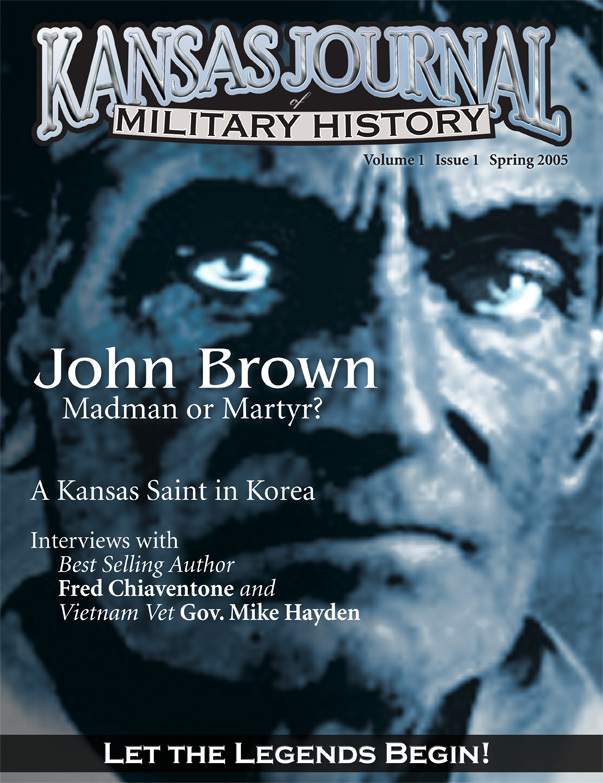 Which Kansas Governor was decorated for service in Vietnam? During the territorial period known as "Bleeding Kansas," some women actually took up arms in defense of the Free-State cause. What were they called? Kansas is now known for wheat, corn and milo. In its earlier days, however, the state was also known for these crops. Veteran's Day originated in what Kansas town? What Kansas college trained hundreds of pilots during World War II? Answers: 1) Kansas River, Missouri River and Smoky Hill River. 2) North Elba (near Lake Placid), New York. 3) Missouri River. Following the Lawrence Massacre in 1863, nervous Kansans placed cannons on riverboats to prevent further raids from Missouri. 4) Denver. 5) Pike's Peak Gold Rush. A smaller strike was reported near Lecompton in 1863. 6) Mike Hayden. 7) Breast Works. 8) Cotton, sugar cane, peanuts, and hemp. 9) Emporia. 10) Washburn University. Site maintained at the University of Kansas. Posted: 15 December 2004.